Spectrum Chemicals & Laboratory Products announces a new chemicals distribution agreement with TCI America making Spectrum a premier US distributor of over 22,000 unique chemicals for research and science. Spectrum Chemicals & Laboratory Products has become a premier US distributor for TCI America, an internationally recognized leader providing specialty chemicals for research and science. This agreement provides Spectrum access to one of the most comprehensive line of organics for R&D, biochemical, medicinal chemistry and general laboratory use and pushes Spectrum’s chemical offering to over 40,000 unique chemicals. Spectrum’s major emphasis is on USP, NF, FCC, BP, EP, JP and ACS grade products, active pharmaceutical ingredients and controlled substances, excipients, dietary supplements, cosmetic ingredients, biochemicals, pre-made solutions, and a complete line of high-purity solvents for critical analytical applications. "The addition of TCI America’s line of research chemicals gives Spectrum access to the early research and scientific development processes in bioscience, glyco-chemistry, material science and organometallic reagents", says Mark Hurd, Spectrum’s General Manager. He adds, "We are committed to increasing our profile across all stages of development through commercialization and TCI America products add to Spectrum’s expanding product line." Founded in 1971, Spectrum Chemicals & Laboratory Products manufactures and distributes fine chemicals for production and laboratory facilities around the globe. All of Spectrum's worldwide facilities are ISO 9001 certified, and the New Jersey and California plants are FDA registered drug establishments and operate under current Good Manufacturing Practices (cGMP). 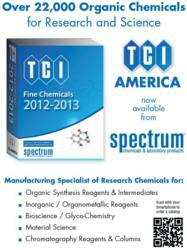 For more information about Spectrum Chemicals & Laboratory Products, visit http://www.SpectrumChemical.com. TCI is an affiliate of Tokyo Chemical Industries which was founded in Japan in 1946. The company has since grown to become a leading international manufacturer of specialty organic chemicals. The TCI America manufacturing and distribution facility was founded in Portland, OR in 1985. TCI has a sales office in Boston, MA, and, with the addition of a new facility near Philadelphia, PA, TCI will offer enhanced service to East Coast customers.